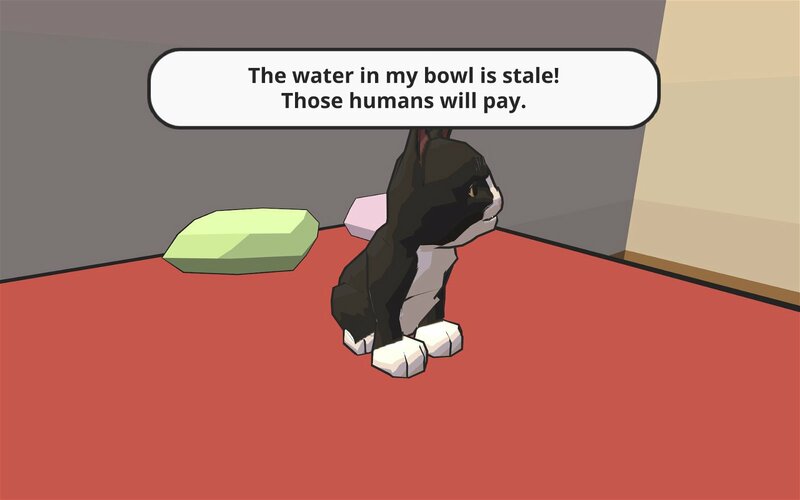 Chris Chung, the developer of Catlateral Damage, claims to love cats, but after the playing his game, it’s pretty clear he understands cats are inherently evil, awful creatures. Despite the internet’s obsession with cuddly pictures of the wee minions of hell, underneath that fuzzy, demure exterior lies a destructive creature of pure hate. This one facet of the cat’s nature is the core focus of the game and, on that level, Catlateral Damage is an unmitigated success. This isn’t a high concept game. 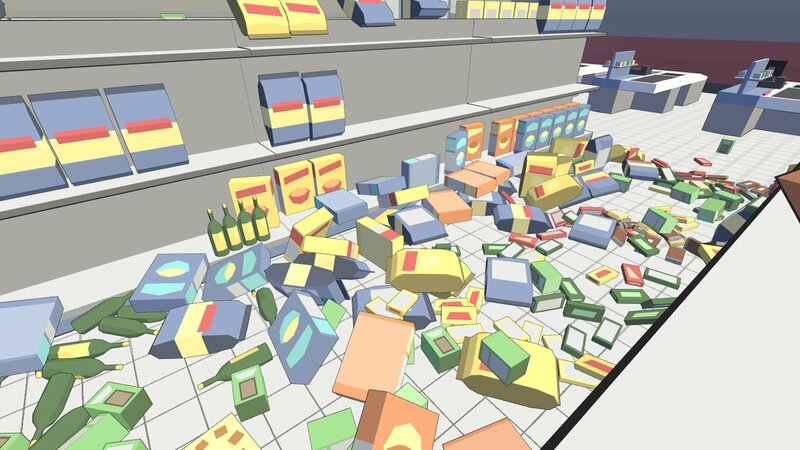 Originally created at a game jam, Catlateral Damage is a first-person journey into the hell that is cat ownership. The game is literally just about a cat running through a house and breaking everything. There’s no story, no lofty goals, and certainly no moral or ethical grounds contemplated here. You’re a cat who is pissed off about, well, cat things, and goes on a rampage. Catlateral Damage is largely a one-note sort of samba. As the cat, the whole object of each of the many levels is to simply break stuff. Jump up on high shelves and knock all the books, vases, and other bric-a-brac to the floor. See that nice big TV just sitting there defenselessly? Push it off and watch it crash to the ground. 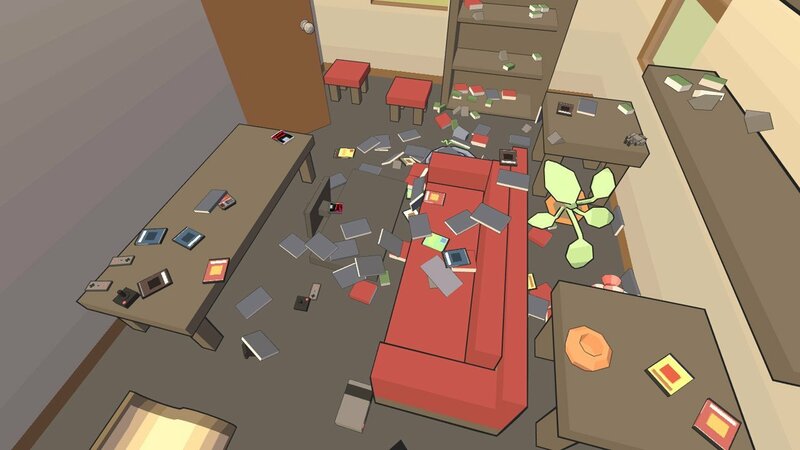 Pictures on the wall can be swatted down, and each randomly generated house is full of hundreds of objects to destroy. The main levels force the mayhem to a timer, so expect a challenge trying to destroy several hundred items in precious few minutes or accept feline failure. Such debris-filled marathons are surprisingly difficult, especially from a first person perspective. Leaping up to high shelves to kill all the dishes can be hard to do, and there’s a constant race to leap from perch to perch, plowing objects over, to reach the goal within the limited time. The next level won’t open until the current level is conquered, and each level offers a new kitty to take control of. In addition to the timed run, each level also sports a sandbox (litterbox?) mode that lets players destroy at a more leisurely pace. 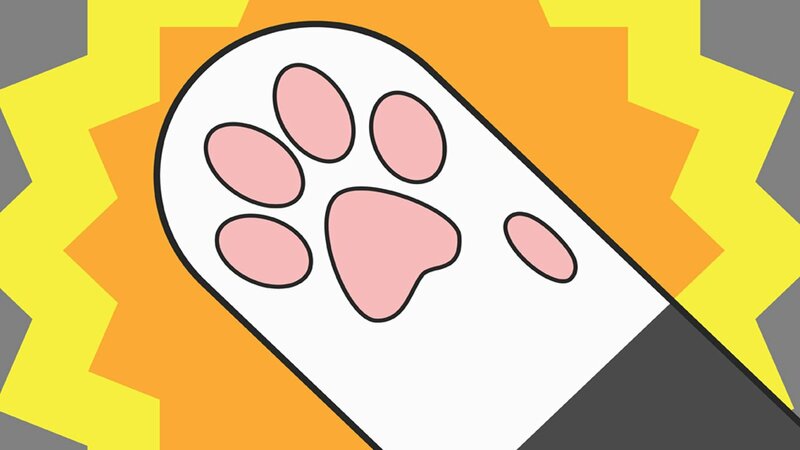 The game also throws in a few extra goodies to keep kitties happy, like power-ups to increase speed, jumping, and paw power. There are hundreds of cat photos to find, along with other collectable items to discover. Attacking all those pesky objects is mostly done by using the right and left mouse buttons to bash them out of the way with cute kitty paws. Alternatively, merely plowing through objects head first is also a perfectly viable method. However you choose to approach the problem of knocking things over, the objects must actually hit the floor to count. This frequently results in having to push something off one shelf, and then another until it reaches the bottom. While this can be frustrating, very few games use multiple height levels so thoroughly as Catlateral Damage. The controls aren’t particularly complex though. Indeed, the game moves like most first-person games, which seems like a lost opportunity. Lining up jumps can be a hassle and the physics of the game don’t feel particularly catlike. An opportunity to use claws to climb and really scratch things up would have been welcome, for instance. 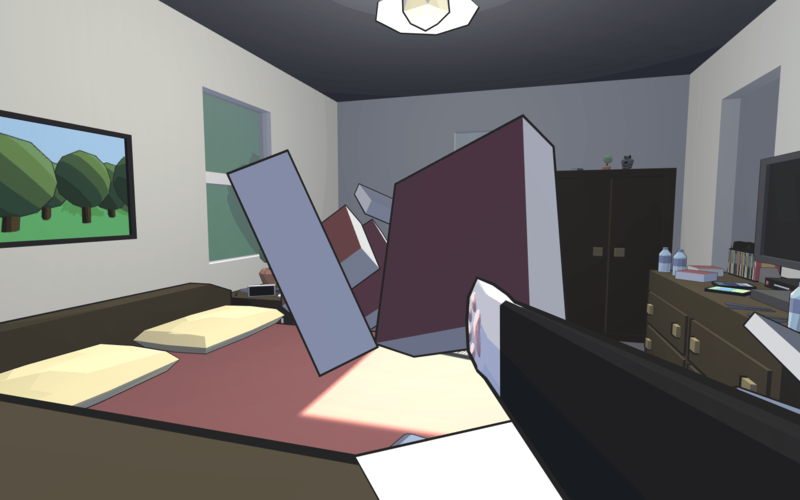 Catlateral Damage does have a fantastic presentation though, especially the minimalistic, cell-shaded graphics. The animated look and feel suits the game play and atmosphere perfectly. Thick lines outline every object and the cat paws (and, when you see it, the whole cat), and the houses have the distinct look of places furnished entirely by Ikea. 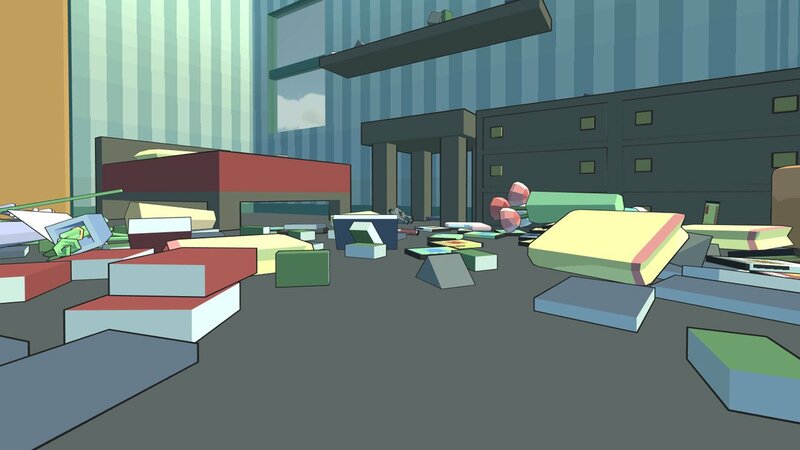 Another huge advantage Catlateral Damage has, despite the limited scope of the game play, is the cheap price. 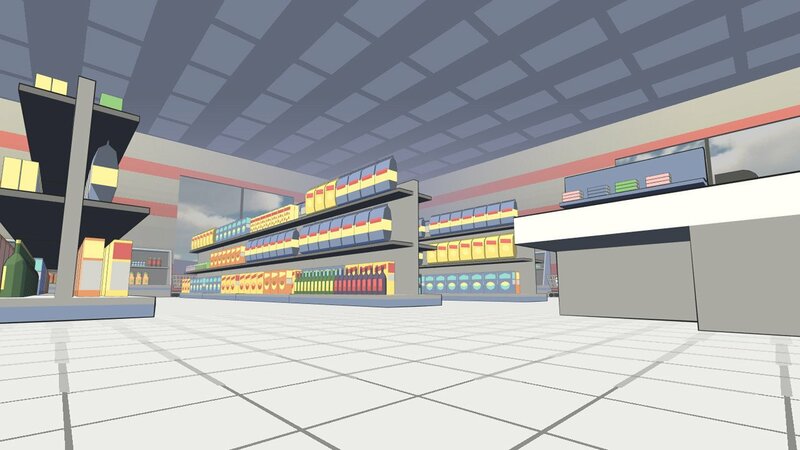 For around $10, you get a game that is functional virtual joke—in much the same way as Goat Simulator. This is definitely a little indie game that started as a simple humorous concept and then expanded to include more content and polish. The result is still based entirely on the same simple concept—knocking things over—but done in such an amusing and content-filled way that it’s hard not to laugh while the playing. Catlateral Damage is largely a one-note sort of samba. As the cat, the whole object of each of the many levels is to simply break stuff.